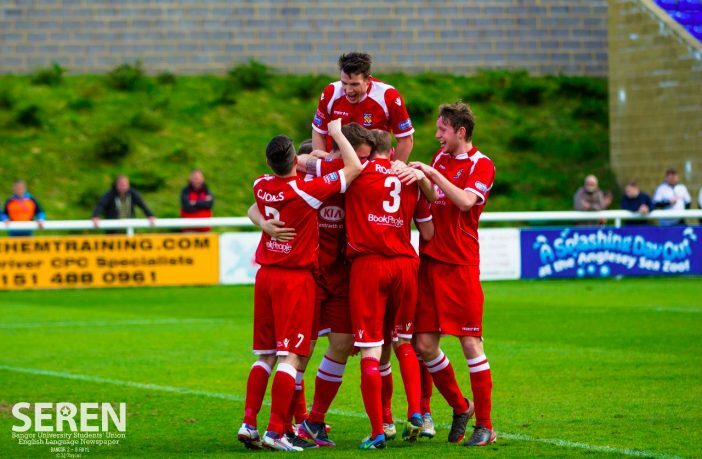 It was a much needed return to form that saw Bangor City defeat rivals, Rhyl, in the first of the Welsh Premier League playoffs this afternoon. Bangor came into the match with a lot to prove after an embarrassing 9-1 loss to champions, TNS, on Good Friday and in front of a strong, 500 plus, home crowd they did just that. From the off the home team had a tight hold on possession with Rhyl barely getting a touch except on a counter attack which always went to waste thanks to a much improved City defence. The first real chance came from Les Davies who put the ball over the crossbar after a decent cross from the right wing. A lot of City’s attack often comes from the left courtesy of Sion Edwards but this afternoon the homeside demonstrated a more balanced attack with Declan Walker returning from injury and a great performance from Chris Jones. Bangor continued to dominate throughout, with a number of chances presented to Edwards and Jones but they couldn’t quite hit the back of the net. Despite the empty scoresheet Bangor fans were happy to see their team as a shadow of those who played against TNS. 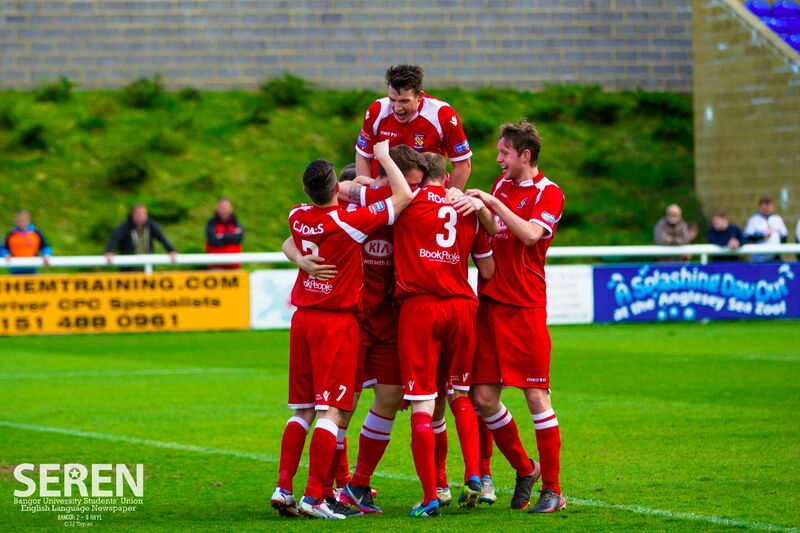 It was a real team effort that saw Bangor turn around a missed chance for Rhyl from a corner. A through ball from Captain, Michael Johnston, was received by Chris Jones who found himself one on one with Ramsay. The Bangor man easily beat Rhyl’s keeper, hitting home and opening the scoring 1-0 at 38 minutes. In the dying minutes of the first half a handball from Damian Allan presented the visitor’s with another chance from a free kick but they were unable to capitalise. Bangor continued their form from the start of the second half with a number of chances for the home team. A Rob Jones free kick was off target and Ramsay was able to make a save from a Miley shot. Rhyl spent the majority of their time in their own half and conceded too many corners and free kicks for a team trailing. It was a free kick that saw Les Davies net Bangor’s second goal after being flicked on by Sion Edwards and crossed to Davies by Chris Jones from within the box. There was no return for Rhyl from here and it wasn’t until the dying minutes of extra time that the visitors really started to pick up the pace in a desperate attempt for a consolation goal but it wasn’t to be. It was a well deserved win for City who owed to their supporters and it’ll be interesting to see whether it’s a result they can replicate when they take on Rhyl once again on Ruesday evening in the cup semi final.